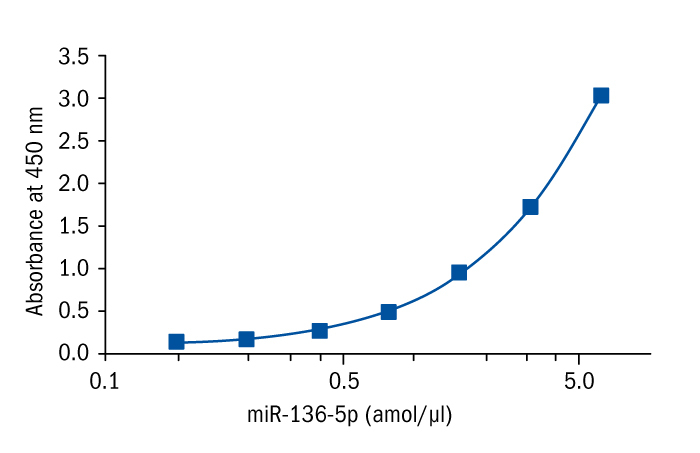 miR-136-5p may play different roles in various types of human cancer; its aberrant expression is associated with tumorigenesis, metastasis, and cancer progression. It has been found that miR-136-5p acts as tumor suppressor and its deficiency induces chemoresistance in ovarian cancer. Another study showed that miR-136-5p might act as a negative regulator in colon cancer progression. Expression of miR-136-5p in osteosarcoma tissues and cell lines was dramatically decreased compared with corresponding noncancerous tissues and cell lines, respectively. In hepatocellular carcinoma, downregulation of miR-136-5p may be responsible for carcinogenesis and aggressiveness of the disease. In contrast, miR-136-5p acts as oncogene in non-small cell lung cancer and is upregulated in lung cancer tissue and cell lines compared to their non-cancerous counterparts. Expression of miR 136-5p was also shown to be aberrantly upregu¬lated in gastric cancer tissues and cell lines and suppression of miR 136-5p inhibited proliferation and invasion in gastric cancer cell lines. Decreased plasma miR 136 levels were measured in knee osteoarthritis patients when compared to healthy controls. Significantly higher expression levels of miR-136-5p in exosomes were observed in patients with preeclampsia compared to normal pregnancies. ZHAO, Henan, et al. Expression of miR-136 is associated with the primary cisplatin resistance of human epithelial ovarian cancer. Oncology reports, 2015, 33.2: 591-598. YUAN, Qinggong, et al. MicroRNA-136 inhibits colon cancer cell proliferation and invasion through targeting liver receptor homolog-1/Wnt signaling. Gene, 2017, 628: 48-55. GUO, Tao; PAN, Guobiao. MicroRNA-136 functions as a tumor suppressor in osteosarcoma via regulating metadherin. Cancer Biomarkers, 2018, Preprint: 1-9. DING, Hua, et al. Downregulation of miR 136 5p in hepatocellular carcinoma and its clinicopathological significance. Molecular medicine reports, 2017, 16.4: 5393-5405. SHEN, Sining, et al. Upregulation of miR-136 in human non-small cell lung cancer cells promotes Erk1/2 activation by targeting PPP2R2A. Tumor Biology, 2014, 35.1: 631-640. CHEN, Xuyan; HUANG, Zhiming; CHEN, Renpin. MicroRNA-136 promotes proliferation and invasion ingastric cancer cells through Pten/Akt/P-Akt signaling pathway. Oncology letters, 2018, 15.4: 4683-4689. WAN, Lei, et al. Plasma miR 136 can be used to screen patients with knee osteoarthritis from healthy controls by targeting IL 17. Experimental and therapeutic medicine, 2018, 16.4: 3419-3424. MOTAWI, Tarek Mk, et al. Role of mesenchymal stem cells exosomes derived microRNAs; miR-136, miR-494 and miR-495 in pre-eclampsia diagnosis and evaluation. Archives of biochemistry and biophysics, 2018.